Amirah Sackett on stage with Vineyard dancers Saturday at the Performing Arts Center. 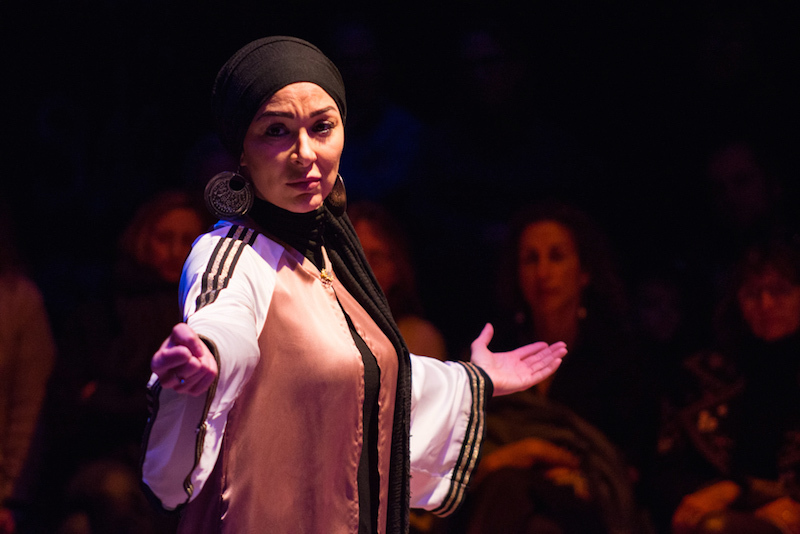 The stage at the Martha’s Vineyard Performing Arts Center became a theatre within a theatre Saturday, when the Yard presented two shows by American Muslim dancer and choreographer Amirah Sackett. Recreating the intimacy of summer performances at the Yard’s home in Chilmark, a square dance floor at the center of the auditorium’s stage was lined on three sides with rows of chairs. Saturday evening, the seats were filled with a mix of Islanders, from senior citizens to school children, many of whom Ms. Sackett had visited during a two-week teaching residency here. Her educational mission continued at the Performing Arts Center, where Ms. Sackett shared her perspective as a reverent Muslim woman and internationally-known hip-hop dancer. Ms. Sackett wore a long, embroidered robe over workout pants and a pair of white Adidas sneakers. Her face was framed by a black headscarf, massive disc earrings and a black turtleneck. 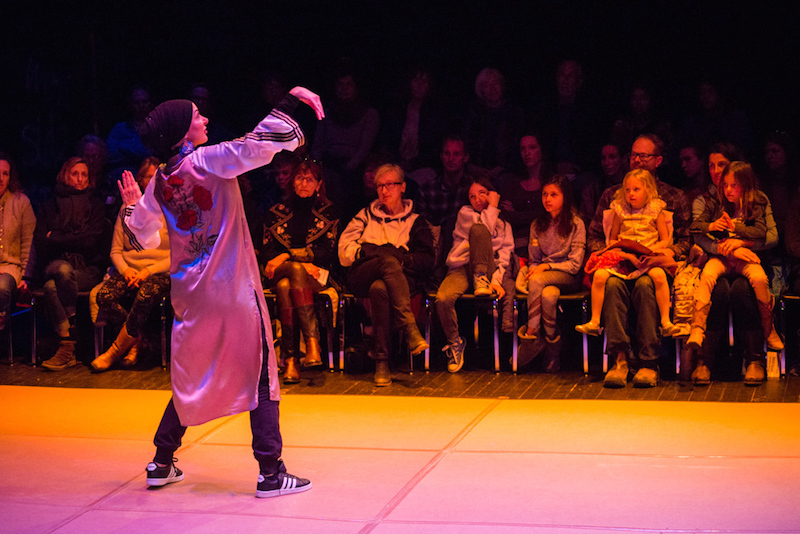 “My clothes reflect my Islamic culture and my love of hip-hop,” she told the audience. Ms. Sackett also noted that other religions—including Christianity and Rastafarianism—have traditions of women covering the head or hair, as she does with her hijab. “Basically what I’m saying, is it’s not that weird,” she told the audience. Nonetheless, Ms. Sackett said her head scarf has also led to confrontations, even in her hometown of Chicago. “I’ve gotten spit at, told to go back to my country—in America!—had crazy conversations on the train,” Ms. Sackett said. Along with teaching Island schoolchildren the basics of hip-hop dance movement, Ms. Sackett worked with adult Islanders in the Yard’s Making It program, which offers dance classes for adults and seniors. For Saturday’s two performances she worked with seven local dancers, including Yard director of Island programs and education Jesse Keller Jason, to develop a dance called Barzakh that opened the shows. The title is an Arabic word that means “barrier” or “partition,” in the context of a place where the soul first goes after death, Ms. Sackett explained. “This piece explores that barrier that’s between two worlds,” she said. 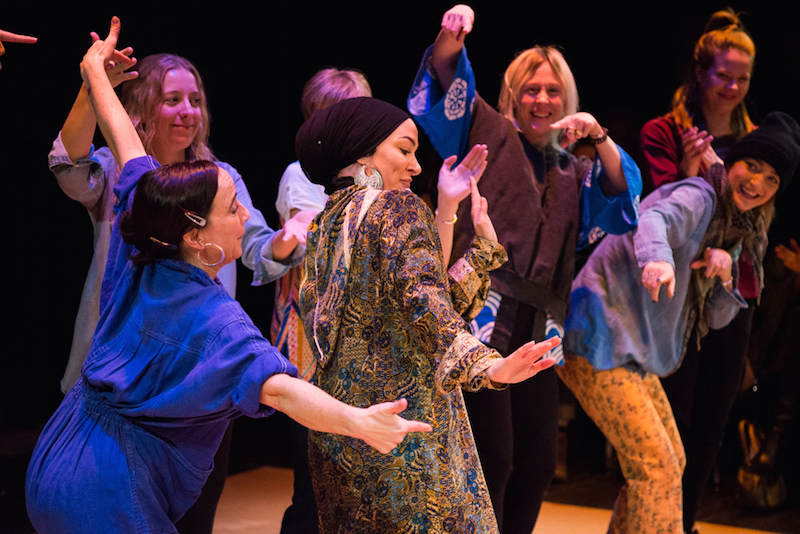 All three works danced Saturday included the words of Rumi, a 13th-century Persian Islamic mystic whose poems are popular among Western readers. “A lot of times, people don’t realize he’s Muslim,” said Ms. Sackett. Gradually, then more rapidly, Ms. Sackett’s dance gained strength and optimism until, at the end, she stood with her hand stretched open. Ms. Sackett’s final dance, Love Embraces All, is about “the barriers we put up inside ourselves and the barriers other people put around us...a fight to choose love, a fight against negative energy,” she said. As the audience applauded, the full company took its bows to the sound of James Brown’s Get Up Offa That Thing and a post-show dance party began. In high-top sneakers, winter boots and battered boat shoes alike, close to 40 people quickly took the floor for a mini-discotheque to the sounds of Michael Jackson, Prince and the Jackson 5, the Five Stairsteps and Blue Swede. Islanders can step out with the Yard again Feb. 22 when the Brooklyn party band Red Baraat, which NPR has called “a genre unto itself,” plays a public dance party at the Chilmark Community Center. For more information, visit dancetheyard.org.